Antonio Silva will also be suspended by the UFC for nine months after the Brazilian heavyweight tested positive for elevated levels of testosterone. 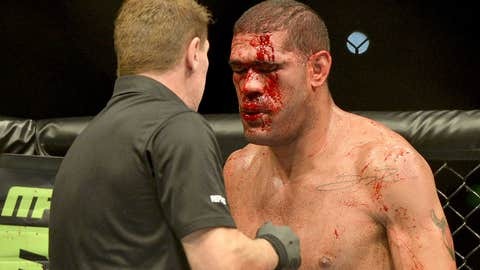 The fight many already call the greatest heavyweight bout in UFC history will now have an asterisk next to the result as Antonio ‘Bigfoot’ Silva has tested positive for elevated levels of testosterone in a post-fight drug test in Australia after his Dec. 6 battle against Mark Hunt in Brisbane. UFC officials released the following statement Tuesday evening. Silva had been medically approved for testosterone-replacement therapy, but like all athletes that use the regimen he is required to stay within legal limits at all times to continue using the treatment. Despite testing that showed Silva was in line with all parameters of the legal limits leading up to the bout, his post-fight test resulted in elevated levels of testosterone. According to UFC officials when speaking to MMAJunkie.com, Silva will be suspended for nine months for the infraction as well has have his $50,000 ‘Fight Of The Night’ bonus stripped and given to his opponent Mark Hunt. The result of the bout will be overturned to a no contest on Silva’s record and remain a draw on Hunt’s official resume. This is Silva’s second failed post-fight drug test after the Brazilian was also popped for anabolic steroids following a 2008 fight in the now-defunct Elite XC promotion. At the time, Silva was suspended for one year by the California State Athletic Commission and fined $2,500. Despite that suspension, Silva actually went onto compete in Japan just a few months later, but never faced any further repercussions as a result of his actions. Now Silva stands as the offender that mars one of the best fights in history after his bloody, five-round war with Hunt became the talk of the town over the last few weeks. UFC president Dana White stated over the weekend that for four days straight after the event, he woke up every morning thinking about the bout between Hunt and Silva in Australia. UPDATE: Silva has issued his first public response, via Facebook tonight. Post by Antonio "Bigfoot" Silva.